Note that this info is for raceweek only! Our most affordable parking is in the Remote Lots at Waterworks Park or at Owen Park. For parking rates, visit our ticket page. See the Event Map and the photos below to help you locate each area. Designated handicapped parking areas will be available in all lots. Parking for Owen Park and Memorial Annex Park is on-site at each park. Henderson Park is at 8500 E. Jefferson (Google map). Besides the Remote lots, premium parking at Bill Muncey Park (behind the pits), Piston Park (Waterworks Annex) and the Judges Stand is available but extremely limited. At the opposite end of Waterworks Park from the Detroit Boat Basin, look for the Sindbads & Roostertail sign at a traffic light. Take Marquette Drive all the way down and stay right. Marquette Drive is at approximately 10326 East Jefferson. The Volunteer Credentials Trailer will be located in the Roostertail/Sindbads parking lot. Judges Stand volunteers (including course boat crews) collect their Credentials at -Judges Stand- starting at 7am on Thursday, Friday and Saturday. 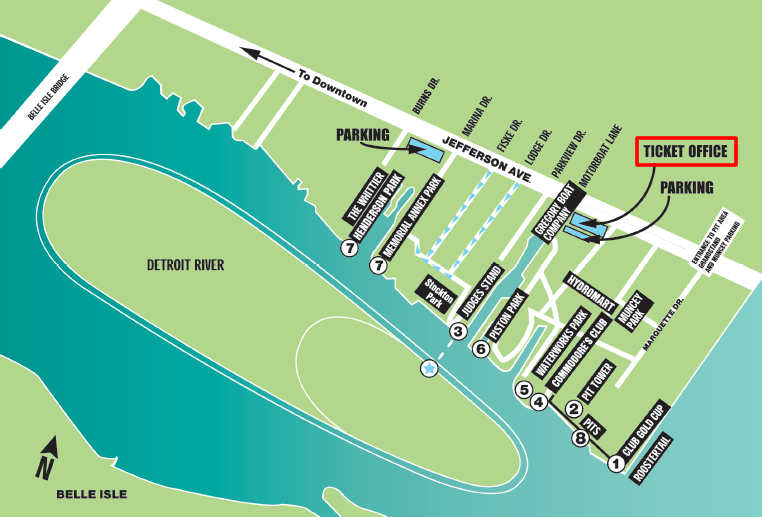 The Media Credential Will Call trailer is located at Water Works Park Hydrofest Will Call trailer located just east of the Detroit Boat Basin Company (formally called the Gregory Boat and Marina ) at 9666 E. Jefferson, Detroit, 48214. Hours: 8-7 Friday, 8-4 on Saturday and floating hours on Sunday. To the right of the white building at 9666 East Jefferson (formerly Gregory Boat Company) is a brown building. To the right of that is Parkview Drive at a traffic light... take that all the way down to the Judges Stand and Stockton Park area. Parkview Drive is at approximately 9334 East Jefferson.